All good books are hard to put down. 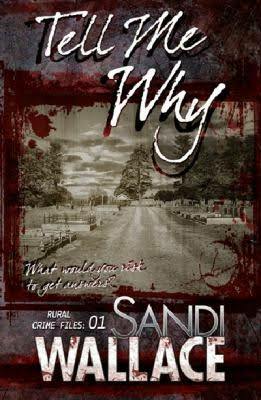 Sandi Wallace’s Tell Me Why is no exception. The twin elements that will win the hearts of crime fiction fans are setting and an interesting sleuth. In Tell Me Why Wallace has both. The setting is Daylesford, a small country town east of Melbourne famous for its proximity to Hepburn Springs, rendering the locale a lure for the rich and famous, an area of luxury hotels and spa retreats. Knowing this before opening Tell Me Why, the reader may be forgiven for anticipating an Agatha Christie cosy mystery, or a sort of corporate crime conspiracy novel. Tell Me Why is neither. The novel is firmly situated in the sub-genre of Australian rural crime, since there is such a thing. The novel has two sleuths, senior constable John Franklin, and Melbourne-based writer Georgie Harvey, each investigating a separate mystery. The inclusion of two sleuths, one from the country, the other the city, plays to the theme of the rural-city divide, although the dichotomy serves more as a backdrop than as an issue explored and developed in a literary sense. Both Franklin and Harvey are well-crafted characters, satisfyingly complex and damaged. Neither sleuth is especially likeable at first. Both are hard edged, carrying their hurts and prejudices close. Both are judgemental, Harvey more so, her heart filled with resentments and frustrations, whereas Franklin is prone to the sort of casual sexism found in Australian rural society. Through both pairs of eyes social realism veers close to stereotyping, with single mothers under the spotlight. Inevitably, the various foibles of Franklin and Harvey drive the plot. The story opens with a short prelude, a catastrophic fire and a mystery. From there the narrative jump cuts from Franklin to Harvey, as their individual inquiries unfold. The jump cuts work well, if making for a seemingly disjointed narrative at first, more demanding of the reader’s attention. The style makes for a fast pace and creates natural tension, the reader forced to wait for vital information as her attention is diverted back and forth between the points of view. What unfolds is a cracking plot. There is never a dull moment. The reader sinks into the story, confident the author is in control of the narrative and won’t disappoint. No small feat. Crime readers are a sharp bunch, likely to extract a calculator to check up on a distance or a passage of time. Thankfully, Wallace manages to avoid stepping outside the bounds of plausibility. The writing is strong, gritty, earthy and witty at times. Tell Me Why is a considered work, written with care. Wallace knows her craft. Tell Me Why is a perfect balance of action, dialogue, and reflection. Description is kept to a minimum, just enough to be evocative. Wallace knows her readership too. Themes appealing to female crime lovers abound. Mothers and babies, the strong bonds of female friendship, a cast of utterly believable and endearing minor characters, all held together in a pleasing the rural setting. Tell Me Why is a compulsive read. The novel should appeal to crime lovers everywhere. I am looking forward to reading the newly released sequel, Dead Again.